Membranes, as perm-selective barriers, is widely used to meet the requirements of industrial separation, water and wastewater treatment, food and beverage processes, pharmaceutical and medical applications, chemical processing, and other separation or purification applications. Due to unique advantages such as product quality, increased separation capacity, lower risk factor, smaller footprint and generally lower chemical usage, the attraction towards membrane technology gains more importance in the field of research and industry. In the area of synthetic membranes, membranes can be grouped as isotropic, anisotropic, ceramic, metal and liquid membranes. Microporous, nonporous, dense, and electrically charged membranes are categorized under the isotropic membranes. From the engineering perspective, pressure-driven membrane separation technologies are commonly used in the field of microfiltration (MF), ultrafiltration (UF), nanofiltration (NF) and reverse osmosis (RO). 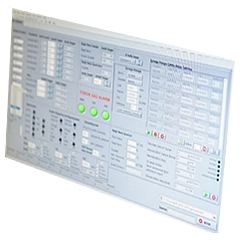 These processes are commercially available especially in the water treatment applications. The permeability is directly proportional to the flux. Therefore, membranes with high permeability is preferred for high flux in the permeate side. 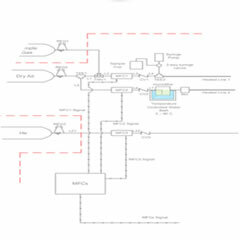 Block diagram of the system is given below.